Chester Ludlow received his Masters in Business Administration (MBA) in 2010 with a 3.19 GPA. Unfortunately, potential employers might not recognize his degree as legitimate, as it comes from Rochville University, an unaccredited institution operating out of Pakistan. Ludlow will also be unable to use the rear window car decal he received with his degree, as he is a pug dog and cannot drive. Fake colleges may not bother checking the legitimacy of their students, but applicants for online and “life experience” college degrees should not pay any money until they have done some checking themselves. “Diploma mills prey on first generation college students, and they actively go after English-as-second-language populations,” said Vicky Phillips, owner of canine Chester Ludlow and founder of GetEducated.com, an information site for consumers of online education. According to Phillips, states with large Latino populations have long been magnets for scams. Florida is a hotbed of bogus operators, and there have been several lawsuits against them in California. Texas has passed laws against them; however, Connecticut lacks strong consumer protections. According to Jaclyn Falkowski of the Connecticut Attorney General’s office, one complaint was filed in 2008, another in 2010, and there have been none since them. The state has not brought any cases against diploma mills in recent memory. Connecticut does have one of the few institutions in the nation that can legitimately do what many of the diploma mills promise, which is to award real college credits for prior life experience. Charter Oak State College in New Britain has long been a pioneer in distance learning since its founding in 1973, and remains a leader among the growing ranks of legitimate online colleges like Kaplan, Capella and University of Phoenix. The fact that Charter Oak has a physical address is important; the ability to actually visit and see a college is one way applicants to verify for themselves that an online institution is real. Unlike diploma mills offering college credits for life experience, Charter Oak does not simply ask applicants to send a resume and pay a fee in exchange for a degree certificate. “There are a couple different ways of doing it legitimately,” said Lori Pendleton, director of admissions at Charter Oak. “There are standardized exams like the CLEP Exam put out by the College Board, or DANTES exam that is offered to military personnel, and those are approved to assess college-level learning. There’s also a portfolio process, in which you document the learning that you have done not by sitting in a classroom but through other experience.” Students who follow a legitimate path to “life experience” credits are far more likely to receive a few course credits than an entire degree. The kind of degree recognized as legitimate by employers or worth transfer credits at other colleges comes from institutions that bear the seal of approval of a recognized college accreditation group such as the New England Association of Schools and Colleges (NEASC). However, even people seeking online or “life experience” degrees at real schools need to know that prospective colleges and employers don’t necessarily give such credentials the same weight as classroom learning. “Some of our more selective institutions will not acknowledge credit that was not learned in the classroom setting,” said Pendleton, who is working with colleagues at other institutions to widen acceptance of non-traditional modes of learning. Alan Contreras is a higher education consultant and former chief of the Oregon Office of Degree Authorization, one of the few state watchdog agencies protecting consumers from diploma mill scams. Contreras has been recognized by the Chronicle of Higher Education as the nation’s leading crusaders against diploma mills, and he has provided CTLatinoNews.com with a checklist for those considering online or “life experience” degrees” and wondering whether an institution is real. Most of the diploma mill business has moved to the Internet, and a lot of it is based offshore. Don’t get a degree from a U.S. college unless it is accredited by a federally recognized accreditor. Some fake accreditors are not federally recognized. Don’t get a degree from a foreign college unless you are certain that it is real. The registrar’s office at any local college in the U.S. can tell you whether a foreign college is genuine. Degree mills often prey on serving military. If you are in the service, check with your unit’s education officer to make sure that an online college is real. Most fake colleges operate out of the U.S., western Africa, the Pacific islands and Pakistan. Latin America has very few fake colleges. Most of the Latin American fakes operate out of Panama or the Caribbean, so be cautious about enrolling in any online program from those areas unless an organization like CARICOM can confirm that the program is genuine. 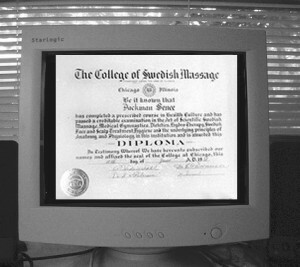 Finally, some institutions exposed as fakes, such as Suffield University, which was ordered to cease operations in Connecticut almost a decade ago for issuing bogus degrees, still maintain an online presence with sites that continue to make the case for what they do. According to George Gollin, a physics professor at University of Illinois who worked with Contreras to ferret out fake degrees, people have lost their jobs for applying with fake diplomas and being found out after the fact. Even worse, people with fake medical degrees have posed as real doctors, sometimes to devastating effect. So a college degree is a lot more than just a piece of paper.